When I first saw this gadget, I thought it was too good to be true! I find this gadget almost puts the Spy Sunglasses to shame. 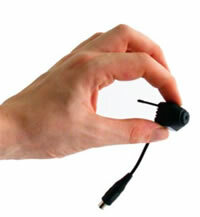 The Wireless Bullet Camera is, as assumed, a wireless camera, with a highly sensitive microphone as well for audio. The tiny camera has a built in 2.4 GHz transmitter which almost makes you wonder where they fit all the video and audio hardware! The receiver can receive data from the transmitter up to 25m away, or 50m outdoors! 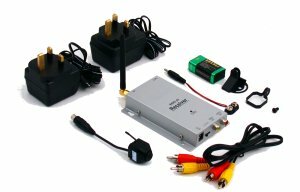 The included receiver comes with all the equipment you need to hook it up to a television or monitor at a safe distance to avoid detection. There are provided adapters for both the camera and the receiver, however the camera can just as easily be powered by a 9V battery. With such tiny equipment you still get quite decent quality. The video camera records 356,000 pixels which is roughly half of the pixels displayed on a standard 1024×768 resolution monitor, while the microphone can capture audio from across rooms of most sizes. I think what I might try to do if I had the gadgets is combine the bullet camera and the MP4 recorder to make the ultimate spying camera for recording! The Wireless Bullet Camera is available from Gadgets.co.uk.